Making the move to a big bed can be a big change for kids. The Summer Infant Grow with Me Bedrail helps to make that transition easier. This soft bed rail protects little ones from bedtime tumbles, forming a barrier between your sleeping toddler and the drop to the floor. The Summer Infant Grow with Me Bedrail helps kids to feel safe and secure in their own bed. The Summer Infant Grow with Me Bedrail can fold down, so it’s still easy for little ones to climb into bed and for parents to sit bedside or change linens. The bedrail is suitable for use with cot bed to single sized mattresses, so you can keep your child feeling secure for longer. 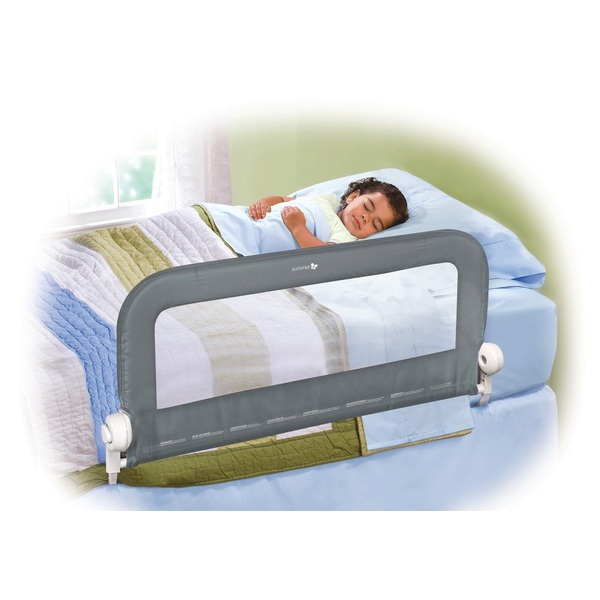 The Summer Infant Grow with Me Bedrail makes sleeping in their own bed a safe experience for kids. Perfect for little ones moving up to their first big bed, this soft and safe bedrail gives security and peace of mind to young children and parents alike. This bedrail meets the current BS 7972 bedrail standard. The panel is 90cm long and 43cm hig, forming a safe and soft barrier between tots and the floor. EU Warning: NEVER leave child unattended. Use only on a flat surface. NEVER use training seat on full size toilet. NEVER lift or carry product with child on it.